Thanks to the SyncroSonic technology, this model senses the stubble length and checks its density 160 times per minute, perfectly adapting to your beard type. An innovative cleaning station will remove up to 99.9% of all bacteria for hygienic shaving. The housing of the shaver might heat up a little during operation. Being Braun's newest series, the 9290cc offers the most effective and advanced technologies. While it definitely took over the Braun 7 series line in terms of comfort and closeness, where it took it by storm is the speed. The SmartClick beard styler with 5 built-in length settings gives you the option to adjust the depth of your cut and create customized looks. The sharp blades of the trimmer have skin-friendly rounded tips designed to prevent skin irritation. High quality performance of the unit needs high maintenance. The Philips Norelco S8950/91 is a refined shaver with multiple shaving features to provide you with maximum comfort during use. 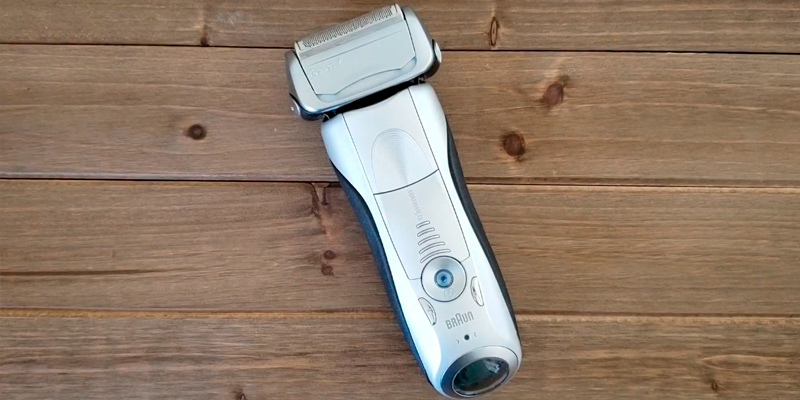 By moving in 8 directions it cuts 20% more hair, while the wet and dry electric shave system makes sure the unit goes maximum close to the skin. A battery life indicator shows how much charge's left so you know exactly when to recharge it. The Pivot and Flex technology ensures that your shaving experience is as comfortable and accurate as possible. According to some users, the operation of the electric razor is quite noisy. 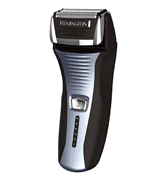 Unless you're looking for a wet and dry shaver in particular, the Remington F5-5800 Foil Shaver may be your perfect fit. Not only does it perform as well as more famous brands, but is also available at a great price, adding to it more appeal. The quick 3-minute charge option offers sufficient power for a single shave that comes in handy when the battery runs low and you have no time to fully charge your shaver. No travel pouch for transportation. 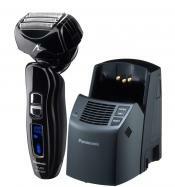 The Philips NorelcoAT830/46 is an ultimate shaver for those who are looking for a strong performance, versatility and comfort of use at an affordable price. With a pop-trimmer and innovative shaving technologies, this is the best rotary shave at this price point. The MacroMotion and MicroMotion system boasts an advanced pivoting head. Tilted at 40-degree angle, it will precisely adapt to any facial area. Meanwhile, the blades will move independently for a closer shave. A travel case is rather small and fits only an electric razor without a charging cord. Despite the launch of Braun 9 series line, the 790cc doesn't lose its popularity. Even though it shaves a bit slower, it boasts the same performance and ensures the identical result, that is a clean and comfortable shave. Backed up by decades of experience and research in different fields, all Braun products stand out for the utmost functionality and clever technological solutions. Yet, the latest Braun series in all product ranges are distinguished by the smartest combos of technologies and innovations that make them the pinnacle of Braun workmanship. 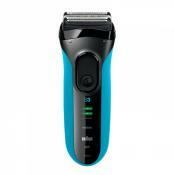 The Braun 9290cc electric shaver is one of such products. 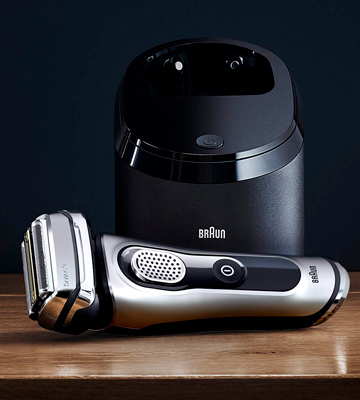 Belonging to the newest Braun Series 9, this model incorporates the newest and the greatest Braun technological achievements for the most efficient and comfortable shave. 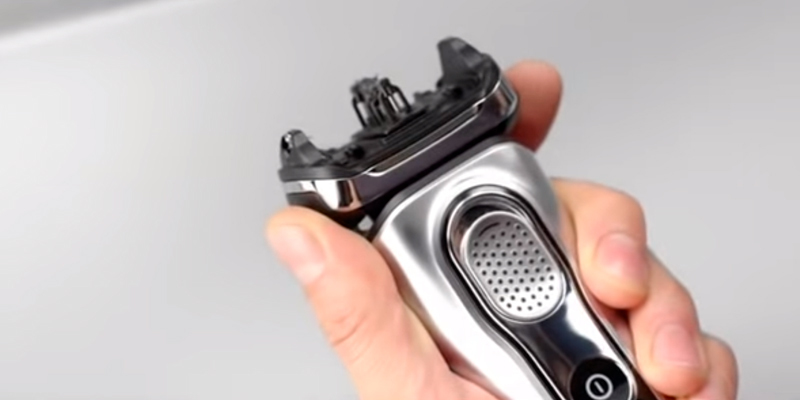 A unique feature of this model is 5 synchronized shaving elements including two OptiFoil components, a HyperLift and Cut trimmer, Direct and Cut trimmer, and a protective skin guard. Specialized for different hair types and combined in a single cutting system, these elements won’t miss any flat lying or growing in different directions hairs. In addition, a pivoting head can move in 10 directions for maximum face adaptability. As a result, you can enjoy perfectly close and precise shaving without razor bumps, skin redness or irritation. Meanwhile, a titanium coating will ensure excellent corrosion resistance and sturdiness of the cutting system and significantly prolong the overall service life of the shaver. A smart charging and cleaning station will take care of your shaving assistant when not in use ensuring hygienic tool cleanness and keeping it charged for the next shave. Many men claim that electric razors do not ensure close enough shave and that's the reason they prefer shaving sticks and straight razors to electric shavers. However, it's not the case with the Braun Series 9. Owing to a couple of smart features it comes fitted with, this model delivers the closest shave ever comparable to that you'd experience in a barber shop. The innovative AutoSense technology will literally read your beard to automatically adjust the motor power to its thickness and add some force in the densest areas. Meanwhile, Braun’s SyncroSonic technology senses the stubble length and delivers 40,000 cross-cutting actions per minute for a clean and exceptionally delicate shave. No matter how long and thick your bristle is, the Braun 9290cc will leave your facial skin perfectly smooth and clean after the shave. To round things up, the Braun Series is one of the best foil electric shavers for today. Crafted for exceptional performance, it will perfectly cope with the bristle of different length and density delivering a cleaner shave and more comfort than ever before. For many men, shaving is at the heart of their grooming process that helps them start their day feeling fresh and confident. The Philips Norelco Shaver 8900 will help you make your shaving routine even more enjoyable and give you that graceful and manly look. The V-track blades guide hairs into the best position for a closer and smoother shave. Each of three shaving heads moves in 8 directions to ensure better cutting precision and capture hairs close to the roots. Besides, the brand-patented Contour Detect technology provides maximum coverage over every curve of your face even in concave areas above the upper lip and on the chin. The distinctive feature of this razor is its SmartClick beard styler with 5 length settings. You can adjust the depth of the cut and get the perfect length to create a variety of customized looks. The beard is a perfect accessory to a man’s face and it will never grow out of trend. 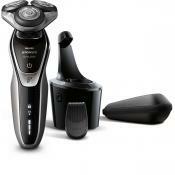 With the Philips 8950, you will find your perfect beard style to add that oomph to your look. The sharp blades of the trimmer have skin-friendly rounded tips for reducing irritation and damages on sensitive skin. Choosing a wet or dry shave is a matter of your personal preference and shaving habits. A special Wet & Dry electric Edition with Aquatic technology allows you to enjoy either dry or wet shave. The razor head glides smoothly across your skin, keeping the blades from tugging or skipping. 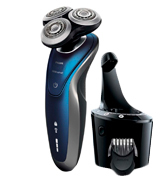 Reasonably priced, this model from Philips also offers an accessory not typical for other razor models within this price range. It’s an automatic cleaning station that will ensure effortless maintenance. By cleaning, lubricating, drying, and charging the tool, it will keep your shaver always ready to use. 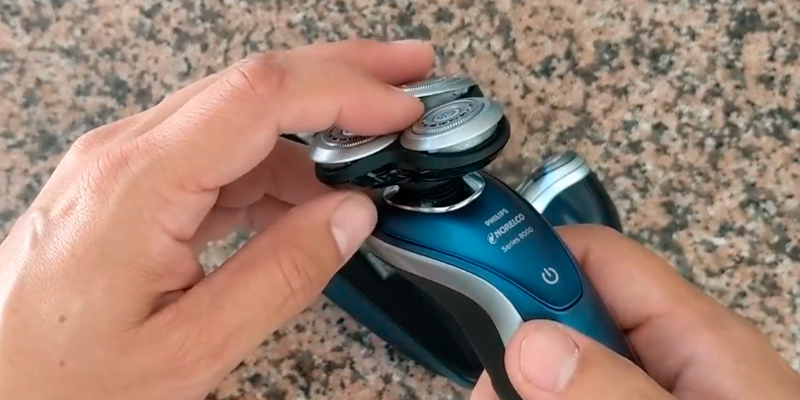 This cordless Shaver is the best travel companion with a useful travel lock option that prevents it from being turned by accident while in transit. 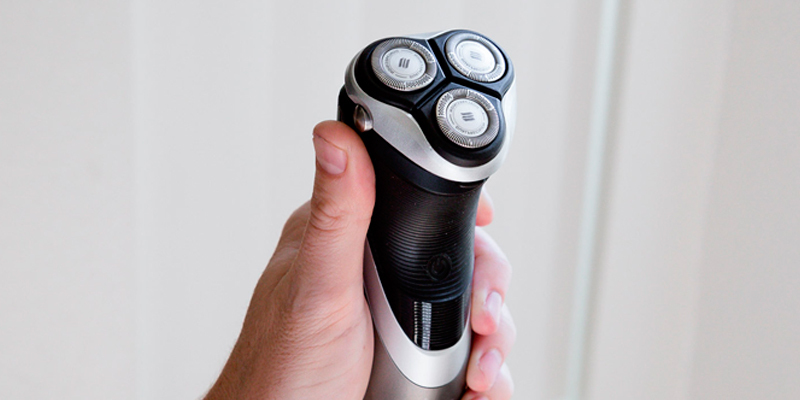 The Shaver is lightweight and ergonomically-designed that makes it a perfect fit for a business trip or vacation. Besides, there is a travel case included in the package to compactly pack the shaver into your travel bag or suitcase and a special cleaning brush to keep your shaver clean when away from the cleaning stand. This is a simple model without lots of bells and whistles, yet it has surgical precision and raw cutting power. Designed for men with stubborn facial hair, the Philips Norelco 8900 is an all-inclusive razor with true evidence of what the Philips Norelco brand is capable of. The F5-5800 is one of the most popular electric shavers on the market right now for a good reason. It has many promising features and provides a fantastic value for money at less than $40. 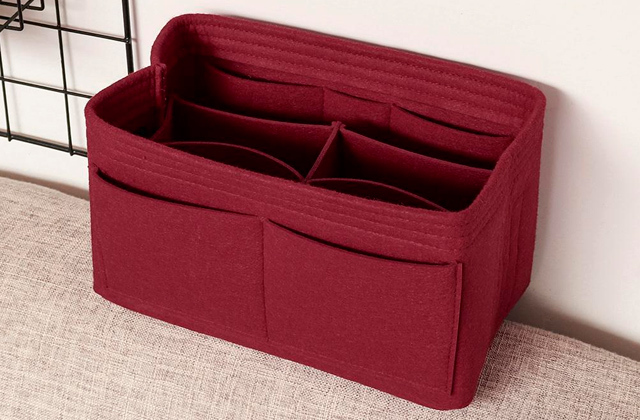 Right after unpacking, you'll know that you've received a high-quality product. 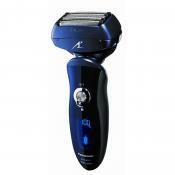 The razor machine has a robust black handle with a stylish silver trim and easy-to-use buttons. Even people new to electric shavers will easily figure out how it works. 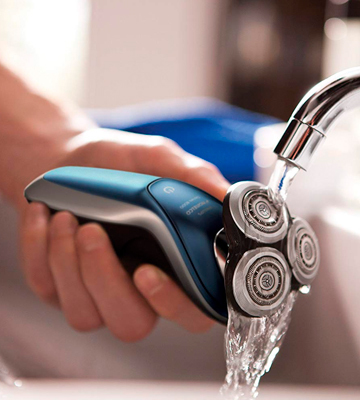 The buzzer boasts many advanced features that make shaving faster and more comfortable. To begin with, it uses the Pivot & Flex Foil technology which allows the head to adjust precisely to your very contours and maintain close contact with your skin during the whole grooming procedure, even when you go around your chin, jawline, and neck. 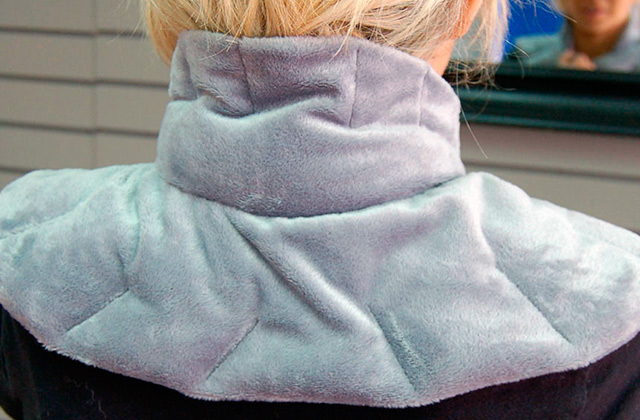 Therefore, you may be sure that you won't suffer from irritation and bumps caused by excessive friction and snagging. Yet, the major selling point of this shaver is the Intercept Shaving Technology. The unit has two foils instead of one that work independently from each other. And as your facial hair passes in between these foils, the unit first trims it and then shaves. All this makes the shaving process much more efficient and faster. So, even if you have 3 days' growth, the shaver will be able to remove all of the hair with fewer passes. This model also has a pop-up detail trimmer that can help you sculpt and shape your beard, mustache, or sideburns. The trimmer is neatly hidden on the side of the handle. So, you won’t have to waste your time on changing heads to groom different parts of your face. Another highlight of this razor is its dual power source feature. To put it simply, you can use it corded or cordlessly for your preference. If used unplugged, it runs for a total of 60 minutes after a full charge, which equals approximately three weeks of operation. And you can always be aware of the charge level owing to the LED battery gauge. 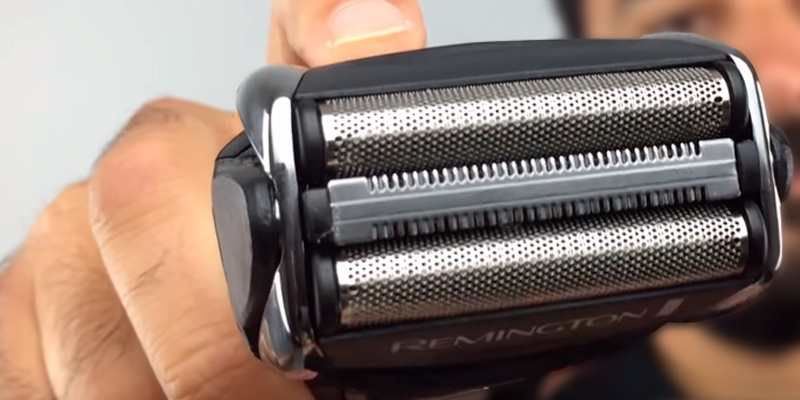 After use, this battery-operated razor is very easy to clean. Although the razor is suitable for dry shaving only, its blades are made from surgical-grade steel, meaning they aren't subjected to rust. So, you can safely run the shaver head under a tap. The hairs come out quickly with no additional cleaning required. To sum up, if you need an effective and easy to use foil shaver, the Remington F5-5800 is a sensible option. It provides a close shave using as few strokes as possible. So, this razor is especially good for new users. The shaver washes up easily. Its a great size and weight, the flex head is really nice, especially shaving my head. the angles can get tricky, that helps a lot. The pop-up trimmer is one of the best I've used yet. It has a nice charge indicator that seems to work well. Philips brand is trusted by men worldwide. Norelco remains one of the most popular electric shavers. 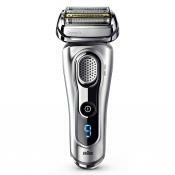 The Philips Norelco AT830/41 provides an all-in-one solution to a great variety of shaving needs. The pivot, flex, and float system of the razor allows the head to be in close contact with your skin without doing numerous back-and-forth motions or turning your face in awkward angles to facilitate the shave. 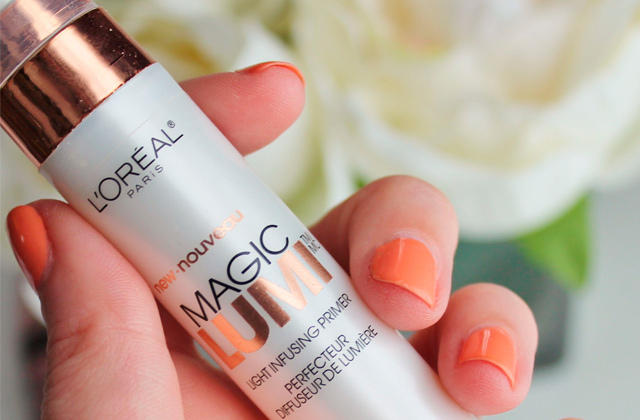 The innovative Lift and cut dual-blades lift the hair up from below the skin, keeping your skin smoother for longer. You can use the shaver dry or wet with soap, foams, gels, lotions, creams, or plain water. Anyway, this shaver will give you the smoothest and cleanest shave possible. 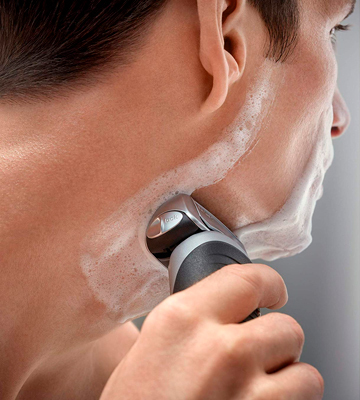 The Philips Norelco razor will treat your skin with care, even in the most tender areas. The Skin Protection System eliminates skin irritation. The low-friction heads with rounded corners are designed to protect your skin from nicks and cuts as you shave. The shaver has a pop-up trimmer which is perfect for the smallest nooks and crannies of your face. It’s very handy to use for shaping mustaches, beards, and sideburns. When the trimmer is not in use, it pops down with a switch underneath. The Philips Norelco 4500 is a highly functional and versatile shaver that will meet all your expectations and make shaving a breeze. There aren’t many extra accessories, and this allows keeping the price for this model down. 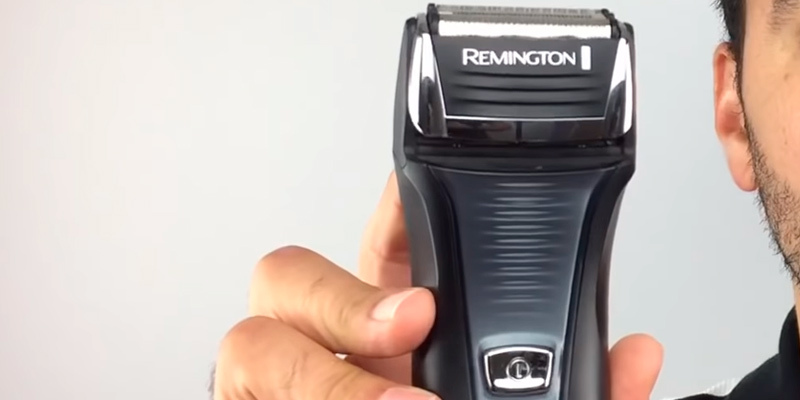 This shaver is great for quick trims as well as for extended grooming sessions. Shaving is a part of a morning routine for many men and great chances are that almost every morning they struggle a desire to sacrifice shaving time to sleep. And when they realize they can’t go out without a morning shave, it often appears that they drastically lack time. In this respect, electric shavers in this concern are a real savior. However, there is a kind of inconvenience about these tools that can spring a surprise on you. If you forget to charge the battery beforehand, in the morning, you might find a “dead” shaver with a flat battery. Most manufacturers offer a quick-charge option that will juice up your battery for a single shave. Philips is not an exception, yet, they go even further. They managed to cut this time almost in half and provide the option of 3-min quick charge. 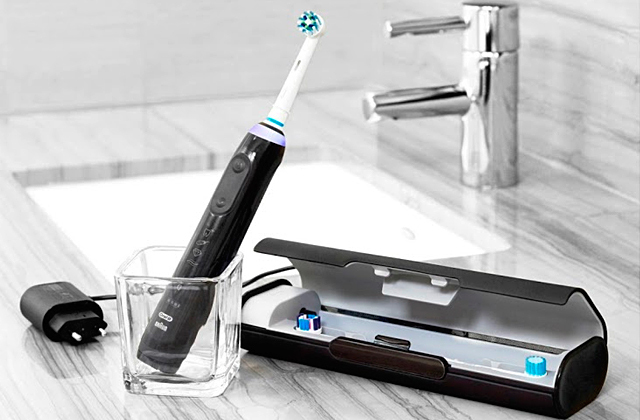 Hence, your shaver will be ready to go while you brush your teeth. That’s an especially helpful option for the situations when every second counts. 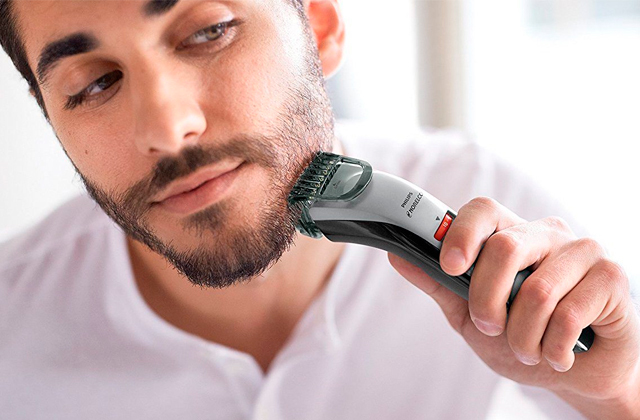 To round up, the Philips Norelco 4500 is a highly functional and versatile shaver that will meet all your expectations and make morning rituals a breeze. There aren’t many extra accessories, and this allows keeping the price for this model down. 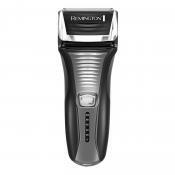 This shaver is great for quick trims as well as for extended grooming sessions. If your skin is sensitive or you have dense African beard, finding an ideal electric razor can be really problematic. Understanding that all men are different and everyone has their own needs, Braun engineers offer the Series 7 790cc, a trimmer that works perfectly on all beard types without exception and guarantees a maximum clean cut, no matter how thick or fine your facial hair is. 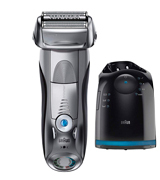 Like other top-rated Braun models, the Braun 790cc trimmer offers a combo of technological solutions designed to provide exceptional shaving results. Thus, a shaver head hosts 3 cutting elements, able to precisely capture the shortest hairs and cut them at a single stroke. Meanwhile, a skin guard prevents skin damages and irritation, and ActiLift trimmer allows cutting off flat lying hairs that most other shavers would likely miss. The MacroMotion 40° pivoting shaver head paired with an AutoSense technology and 8D flexible shaving system will easily adapt to your facial contours and skin to pick more hair in one pass, even on dense stubble. Some premium perks are also here. Smart Clean and Charge station eliminates the need to manually clean the device. No need to dismount the foil and clean the heads. Just insert the shaver into the station head down and let it do its job. 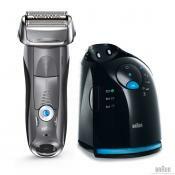 In about 50 minutes your electric razor will come out cleaned, lubricated, and fully charged. At the same time, the light indicators on the housing help skip the guesswork by informing you when it's time to recharge it, clean the head or change the foil. Following the basics of the branded Braun design, the 790cc also comes in 100% waterproof casing and is suitable for wet and dry shave alike. Hence, if your skin is prone to redness and rash when shaved dry, with this shaver, you don't have to sacrifice your comfort and still can use your foam or gel. Other than that, to further personalize your shaving experience, the Braun 790cc offers 5 different shaving modes ranging from sensitive to Turbo. So, you can say goodbye to razor bumps and scratches on sensitive skin and unshaved patches on a thick beard. And all of this is at a single press of a button. 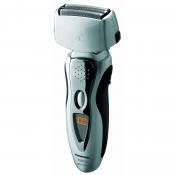 You select the desired mode and the shaver will automatically adapt the operation. 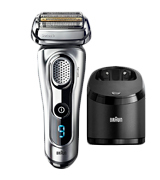 All in all, the Braun 790cc is a highly functional and technological shaver. Created with individual user needs in mind, it will deliver smooth and irritation-free shave for all beard and skin types, no matter how long or short, thin or thick your facial hair is. An electric razor is a traditional accessory you’ll find in the arsenal of any man. Unlike traditional safety razors, electric razors offer exclusive shaving comfort and quality of shaving. If you’ve decided to upgrade your old safety razor, you’ve come to the right page. 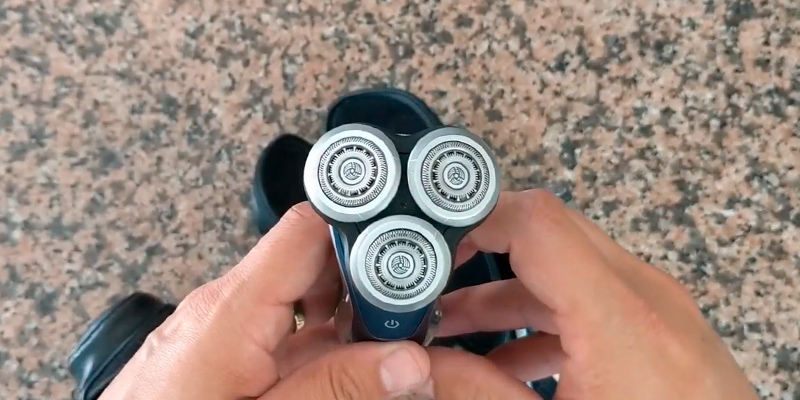 For this review, we've selected five of the popular electric razors from renown brands so you can choose the best suitable one, depending on your skin peculiarities. We hope this review will make the choice less tricky for you and you'll find out guides helpful. If you do not know what to give your teenage daughter as a gift, consider buying an epilator. Seeing how epilation is popular these days, she's sure to love it! Another great gift idea for girls is buying them a box of bath bombs. Not only will they make bath time more fun and relaxing, many of those bombs contain essential oils to take care of skin. So, read on for our popular selections and make your choice. First of all, you need to decide which shaver type you need. Nowadays, there are two types of electric razors: rotary and foil. Rotary shavers work thanks to a rotating circulation of knives, which are located in special shaving heads. 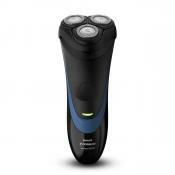 This type of electric razor is designed for an uneven, short, thick beard. As for foil shavers - the device shaves bristles with the help of vibrating blades, which are located under the foil head covers. Therefore, your skin is in direct contact with them. As for the safety, it takes a lot of effort to cut yourself with an electric razor. Foil models cope easily with long bristles. In addition, if you have sensitive skin, this model will cause you less discomfort and irritation. When talking about usability, you need to pay attention to design of the floating heads. If the razor has this design, you can follow facial contours for smoother, more comfortable shave. Moreover, thanks to the floating heads one shave is enough to remove all bristles. Floating heads definitely provide a safer, more comfortable shave. Also, you should consider the additional options each electric razor has. Some shavers for men have a battery indicator or LCD screen. Thanks to this feature, you will know whether you need to recharge the battery before a trip or not. 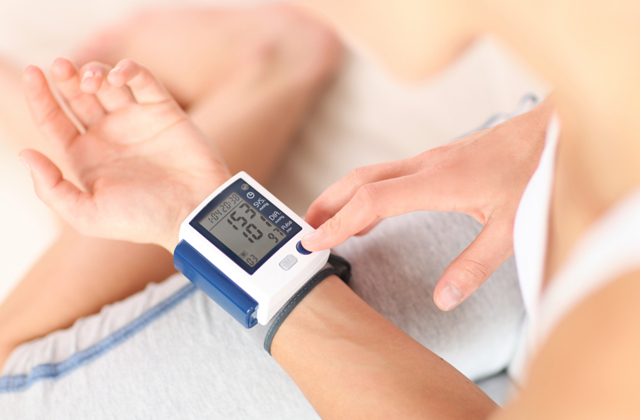 The device can work from both battery or the mains. Also a combination of both options is possible. this feature allows you to use your shave on business trips or journeys. If you use the mains, a voltage function allows you to use different power sources. 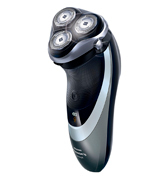 The difference between accumulator electric shavers is battery life and speed of recharging. The higher these parameters, the better the quality of razor. 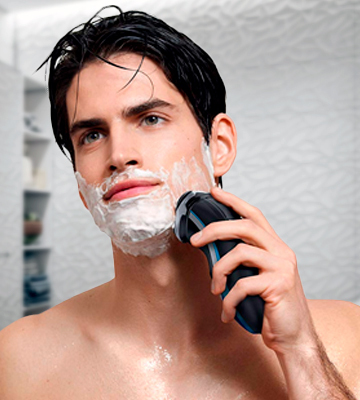 Some men's shavers allow for both wet and dry shaves. All electric shavers can cope with dry shaving. 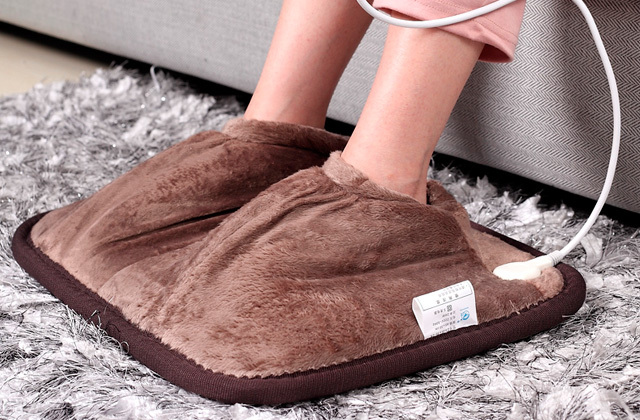 This method will be comfortable for trips because you have no opportunity to shave properly with foam and warm water. However, a wet method of shaving will be best suited to people with delicate, sensitive skin. In addition, you need to pay attention to the components and design of men's shavers. An ergonomic design will make the shaving process much easier. For example, rubber inserts allow you to comfortably hold the razor, even with wet hands. Additionally, great feature is the additional attachments for various jobs, such as a trimmer. Several electric razors have great functions such as the cleaning mode - you don't need to spend time cleaning your razor. 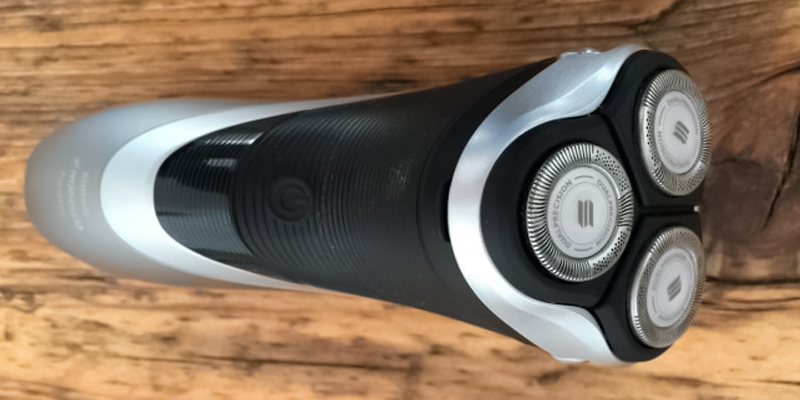 Q: Electric shavers vs disposable razors: what to choose? Though many people think they save money by buying disposable razors, a shaving machine is eventually a much more budget-saving option. With disposable shaving, you will have to replace blades pretty often especially if you have thick and coarse bristle and will have to buy shaving foam, gel or cream on a regular basis. 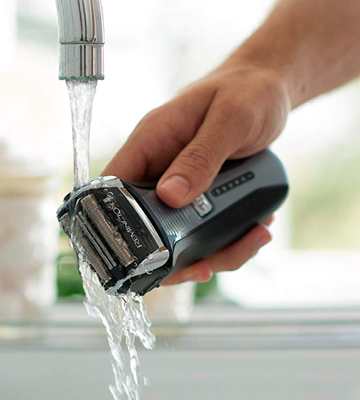 Meanwhile, electric shavers require cutter replacement times less often and are suitable for dry shaving, significantly cutting your expenses on shaving products. Electric shavers are more comfortable, quick, and convenient. 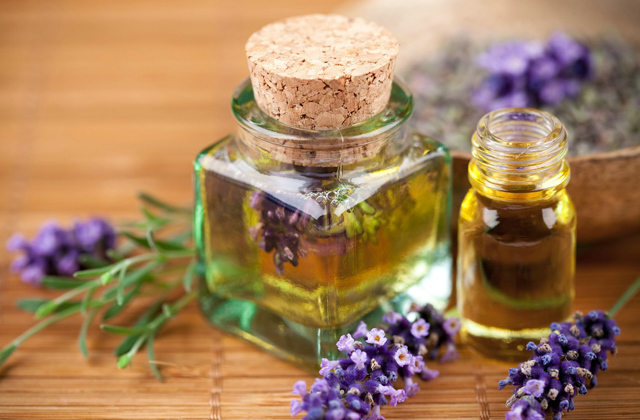 But what’s more, they are more gentle on your skin causing less to none damage and irritations. For this reason, shaving machines are highly recommended for people with sensitive skin prone to rash and razor bumps. Q: What is better, rotary or foil shavers? A: It’s commonly believed that foil electric shavers work better for long hairs and ensure delicate shaving for sensitive skin preventing irritation while the rotary type is optimal for short thick bristle. Some users state that a foil design is closer on cheeks while rotary shavers provide cleaner shaving results on the neck area. However, today, with manufacturers struggling for top-quality and high-end performance for their products, electric razors come packed with bunches of technologies and smart functions that make both types good enough for any situation. Hence, a lot comes down to personal preferences. Q: Why does the foil on the shaver wear out fast? You’re pressing the razor too hard while shaving. It pushes the cutters against the foil wearing out both elements. Reduce the pressure and let the shaving machine do the work for you. The foil can get damaged as a result of dropping the shaver or banging it into something. When not in use, do not forget to cover the cutting head with a protective cap which usually comes in the package. If you are shaving longer than 5 minutes, the foil will wear out quicker. Actually, electric razors are initially designed for a quick shave and, as a rule, they really deliver close and clean shave at a single pass. If you have a heavy beard, the foil will naturally wear out quicker than on a soft beard. Finally, the lack of cleaning eventually cause foil wearing out since it gets clogged with hair and skin particles. Clean the cutters on a regular basis and they will serve longer. Q: Is it hard to clean an electric razor? A: Most electric shavers do not require any specific maintenance and can be cleaned without a hassle. 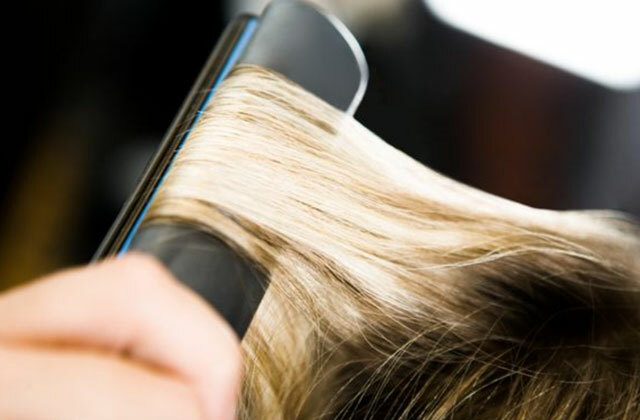 The easiest way is to remove the cutting head and gently tap it to shake away the hair. Some models are designed to be cleaned with running water when the razor is turned off and unplugged, and most come with a special brush to remove hair from nooks and crannies. There are also more sophisticated electric razors which are quickly cleaned inside the storage base. 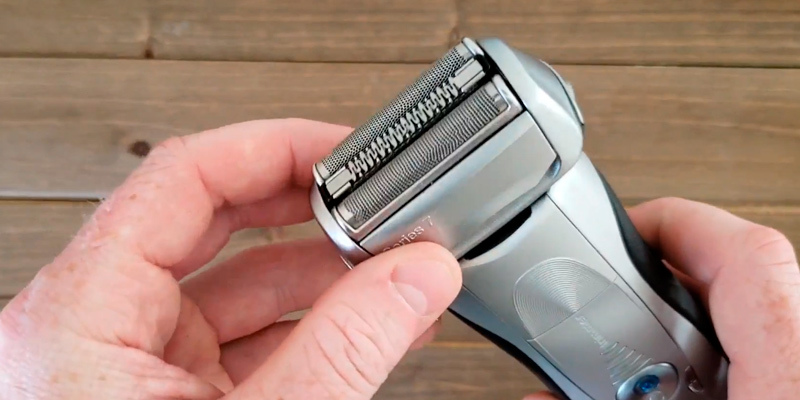 Q: How often should I change blades and foil on my electric razor? A: Commonly, the replacement period is specified by the manufacturer in the user’s manual. On average, the razor heads and cutters require changing every 12 to 18 month depending on how often you use the shaver and how thick your beard is. 1. 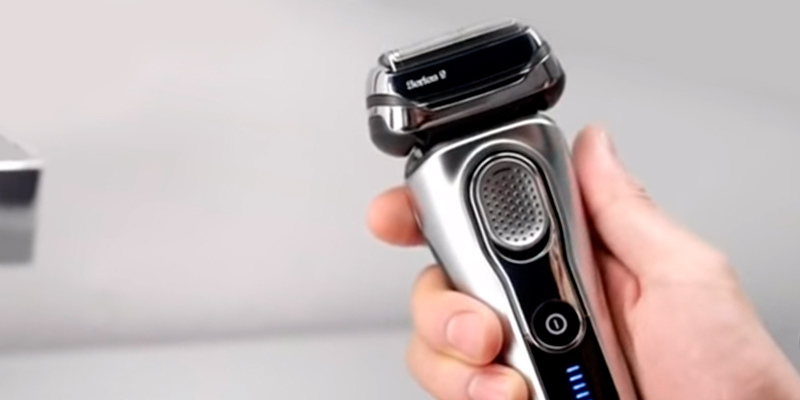 Ben Slater How to Buy the Best Electric Shaver, Which? 2. Taryn Brooke Everything You Need to Know About Shaving With Electric Razors, CheatSheet. July 03, 2016. 3. How to Shave With an Electric Shaver, wikiHow. 4. Dennis Green Here's why the beard might finally die in 2016, BusinessInsider. January 15, 2016. 5. Facial Hair Trimming: 5 Tips and Tricks for Doing It Well, Birchbox. 6. Matt McMillen What Men Don't Know About Shaving, WebMD. December 17, 2012. 7. Electric razor, Wikipedia. September 6, 2016.